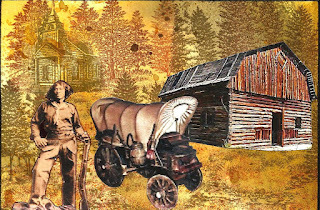 This weeks theme on Sunday Postcard Art is Rusty ole Barn. I really struggled with this. Was trying to forget about it really but Mandy will keep reminding me of things and since she was at our house for the weekend I just couldn't get away with it (she keeps telling me I should get out of my comfort zone). So here is my postcard for this week. Well worth the struggle - it's fab! Nice colors and combination of rustic images! Great postcard, thanks so much for playing this week.